Tina Durham is a transwoman who used to be a pro athlete and is now working as a personal trainer. One day when her washing machine floods her house, the plumber who arrives is not what she expected. Joanna "Joe Mama" Delario is not only good at fixing things, but she's cute and she's the coach of a roller derby team. Tina soon joins the team and starts dating Joe, but Joe doesn't want anyone else on the team to know. This, of course, does not go well, and Tina and Joe find their relationship complicated and frustrating. This is a very short novel - at 130 pages I think it qualifies as a novella. It's told entirely from Tina's first-person perspective, which is different from most romance novels I've read. Usually you get an alternating perspective of each of the love interests, which I think adds to both the passion and the tension. The criticism I've heard most about this book is that the romance isn't very palpable. Many readers just aren't feeling it. While it didn't fall totally flat for me, I think it could have been improved if we had gotten inside Joe's head more. I really wanted to get to know her more than I did. Tina wasn't quite as fleshed-out as she could have been either. We know that she is transgender and was previously considered a man, that she is recently married to a woman, and there are hints about a poor relationship with her family. But we didn't get the full story on any of those things which, again, I think is because the book was so short. I wanted more though. This really could have easily been a 300+ page novel - there was enough here, definitely. I think that would have made Tina feel more real to me. Otherwise, I found it pretty fun. I love roller derby! I love badass women with pun-based names pushing and shoving each other while roller skating! The female camaraderie was one of the best parts of this story, though it was those same friendships that complicated things for Tina and Joe. There's a subplot too, about one of Tina's clients. Jeremy is younger and very competitive and Tina begins to suspect that he has an eating disorder because he is sometimes weak or faint when they meet. Their relationship, although it was a professional one, really did mean more to both of them and I found this part of the story very sweet. I wonder if he will star in a future book, because this is actually third in a series, and the first two center around two of Tina's friends, Ben and Eddie. Although it's not without its faults, I found this story pretty enjoyable. 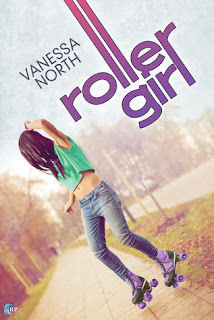 If you're looking for a f/f romance this may be a good choice, though it will definitely help if you are interested in roller derby!